During a recent workday at Methodist Hospital, Alex Belsky took part in a unique procedure that let him see the impact members of his profession can make. The procedure was a success, and the story illustrates how cardiovascular sonography is an integral part of healthcare. Alex recently graduated from Nebraska Methodist College with his Associate of Science degree in sonography. He majored in Cardiovascular Sonography, a job that he performs daily at Methodist Hospital. For Alex, specializing in this field was an easy choice to make. 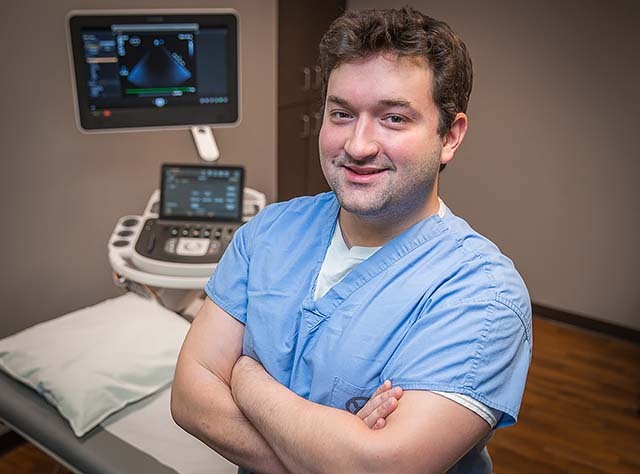 Diagnosis and treatment cannot begin until a cardiovascular sonographer, like Alex, provides an accurate ultrasound of the heart and/or circulatory (vascular) systems in the body. From the ultrasound images, the sonographer builds a report of preliminary findings. Next, a cardiologist or vascular surgeon reviews the results and determines the best course of action for the patient. The life of a cardiovascular sonographer is one where, truly, anything can happen. One day, you could have a series of fairly standard tests whose results you pass along to the cardiologist. The next, you could be assisting in a procedure like the one Alex performed recently, an emergency pericardial effusion, where the speed and accuracy of the actions you take make a real and immediate difference in the patient’s outcome. Alex understands that every test and aspect of his job is important, whether routine or emergency. He also believes that the daily opportunities to connect with patients make his career especially fulfilling. That kind of feedback means a lot to Alex, who is thrilled to work at a facility that’s renowned within the area for the compassion shown to patients. That attention to compassion within healthcare is something that starts early on at Nebraska Methodist College. In addition to the technical aspects of healthcare, NMC also emphasizes the subtle ways that every member of the care team can positively impact a patient’s life. Alex has learned this means truly treating each person as an individual. This type of learning environment is made possible through the unique interaction between professors and students at NMC, something that Alex appreciated throughout the 21-month associate degree program. Every day, Alex is making a real difference. 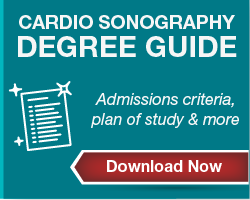 Cardiovascular sonography is one of two sonography tracks offered at Nebraska Methodist College. The other is multispecialty sonography, which focuses on a variety of other systems within the human body.